A few weeks ago a group of friends planned a hike up to Dog Mountain. It was on a Friday, and I arrived way late, so I was forced to stop at the lower viewpoint just as a wonderful light display had ended. That short little hike is no joke, and my knees are still paying the price! 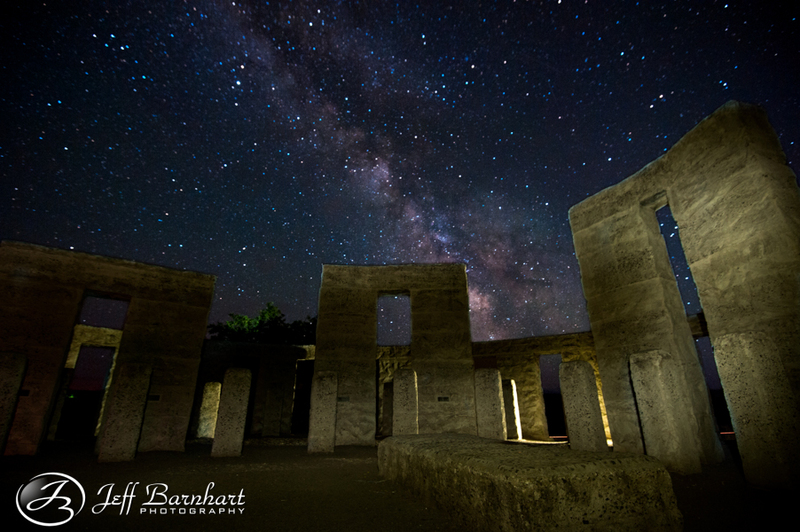 When I got back down to my car I texted and called my friend Dan Sherman to see what their plans were after the hike since there was a “meteor shower” that evening. I really wanted to go to Trillium Lake to see if I could get some reflections of it, but it was raining there, and seemingly all across the Pacific Northwest as well, so after getting no response and waiting 30 minutes, I decided to just call it, and head home. As I approached the Bridge of the Gods, I finally received a call from Dan wondering where I was. I pulled over just before crossing, where Dan told me he had the idea of heading out to the Stonehenge replica down the gorge. I can’t believe I didn’t think of that! Yes! And it would be clear skies there!!! We met in Hood River for some late night dinner before heading out. When we arrived it seemed like every other photographer had the same idea, but I guess it made sense, since it was really the furthest west you could be to shoot any stars without too much cloud cover. I shot the stars for several hours, not even getting 1 shooting star, which by the way was just “space junk”, not actual rocks. It wasn’t until everybody else had left that the southern clouds that had blocked the Milky Way would pass and this glorious sky would show itself. The shot below is a 3 shot pano, with the lights from Big’s Junction lighting up the rocks! 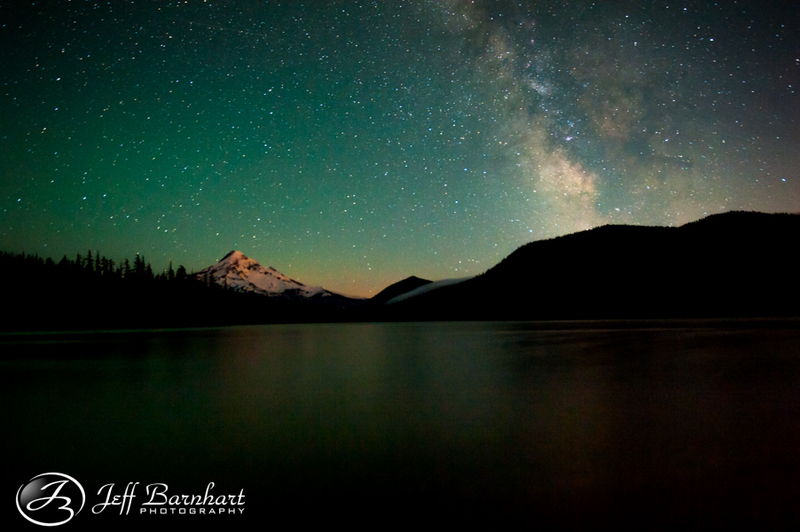 This last weekend I went up to Trillium Lake to see what sunset looks like. It wasn’t good, but conditions were perfect for some night photography, so I headed to Lost Lake to pull another all nighter. 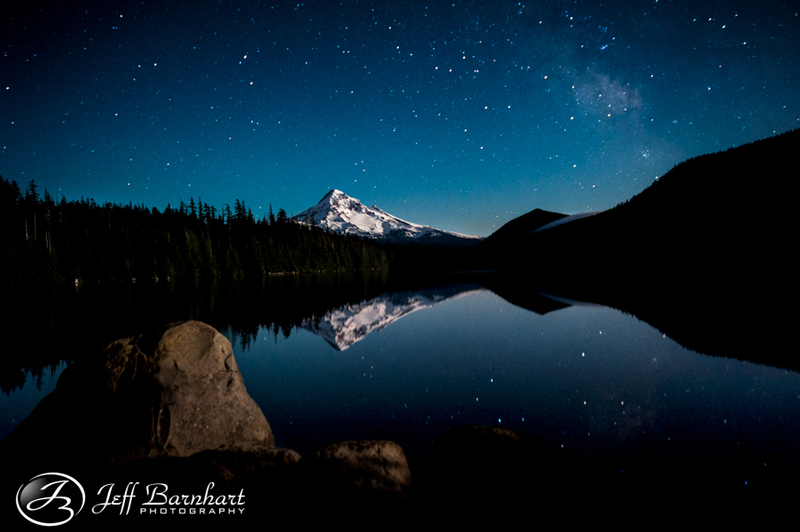 I have been night shooting on several lakes, but haven’t been fortunate enough to get a perfect reflection until now! The shot before the one below was a 15 minute exposure, and when you take long exposures, it’s best to turn noise reduction on to get the clearest picture possible, but when you do this the camera takes twice as long as the shutter speed to process the image. This means that a 15 minute exposure would take 30 minutes to produce. While I was waiting for the camera to finish processing, I noticed that the lake was dead calm and I could see perfectly still stars in the water! I was freaking out! Hurry camera, hurry!!! Finally it finished, and to was able to capture this! With the equipment I have a true reflection like this is as close to impossible as it comes, as the water has to stay still for 30 seconds while I capture the image. This means, no wind gusts, no fish jumps. Nothing! The last shot I took this evening was taken after the moon had set, and I didn’t even see these beautiful greens in the sky! I probably wouldn’t have even known they were there if I didn’t adjust the white balance and bring up the exposure, just out of pure curiosity! It’s quite normal to capture colors like this while photographing the night sky and not actually seeing them with your eyes, but it always blows my mind when I do.